Online video poker is one of those online games where the house edge is minimal, so with proper play and a little luck, you have as good or better a chance of coming out ahead as you do playing just about any game in the online casino. Here are a few strategy tips to give you your best chance at online video poker. There is a	standard pay table in video poker which pays even money for a pair of jacks or higher, 2-to-1 for two pair, 3-to-1 for three of a kind, 4-to-1 for a straight, 6-to-1 for a flush, 9-to-1 for a full house, 25-to-1 for four of a kind, 50-to-1 for a straight flush and 800-to-1 (or a progressive jackpot) for a royal flush. If the odds presented at your online video poker table are not at least this good, find another one. An online video poker machine will give you the option of playing one to five “coins,” that is, up to 5 times the amount of a standard bet. You should always play the maximum amount, as this is the only way to qualify for the progressive jackpot, if there is one. If 5 times the bet amount is too much for you, use a smaller standard bet. In traditional draw poker, a player may keep a pair with an ace “kicker,” since an ace is such a powerful card. In online video poker, where you are only trying to make a qualifying hand, an ace is not significantly stronger than other cards in the deck. So, keeping one with a pair just hurts your chances of making trips, which has a much better payout. If you have five cards with no pair, keep the ones over ten and dump the rest, since pairing any card over ten will give you a winner. If you have no high cards and no good flush or straight draws, dump all five cards and hope for the best. If you have a hand like Js Jh 3h 6h 9c, it would be a mistake to throw away the Js and 9c to go for the flush when you already have a winning hand. On the other hand, if the 9c were a 9h, your chances of making the flush are good enough that it’s worth the risk. 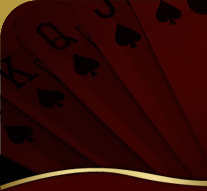 There are many variations of online video poker, including versions where deuces and/or jokers are wild. In these variations, you will need stronger hands to qualify and the payouts will be reduced, since your odds of making various hands improve significantly. Make sure you know and understand the qualifying hands and payouts for the online video poker game you choose to play. Reel Play Jacks or Better.